Welcome to Geekade’s newest monthly feature, The Macabre Movie Mausoleum. With this feature I will showcase and review B, and perhaps even C and D, horror movies. My goal with this is to steer clear of the popular or well-known titles. You can read reviews of those anywhere. Here, we will delve deep into the bargain bins, hidden horrors, and failed flops. As a special treat, and part of Geekade’s 31 days of Halloween, you’ll get a new entry every Friday in October! Afterwards, it’s once a month for you. They say that opinions can’t be wrong, but screw them and whoever they may be, these are my reviews and Dr. AzarRising’s opinion is the only one that matters. Bucket-o-popcorn – Great movie. Few on par with it. Large Popcorn – Good movie. Entertaining with few flaws. Medium popcorn – Decent movie. Either the plot was good and the acting was bad, or the acting was good or the special effects were bad. Small popcorn – Bad Movie. Of the plot, special effects, and acting, two of the three were bad. It’s rare that a Hollywood star can lose their career and come back as sort of B-movie icon, but Val Kilmer has done just that. And if anyone disagrees that he was ever a star, just remember, he was the goddamned Batman! Val has recently starred in a slew of direct to DVD (or BluRay for you hoity-toity rich folk) movies, many of which have been thrillers. Perhaps some haven’t been too great, but The Traveler was entertaining. 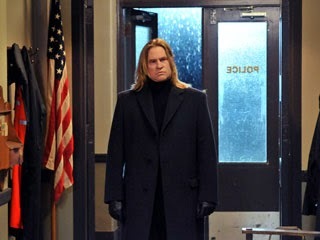 During a bad storm a police station is in the midst of a slow night when a drifter (Val Kilmer) walks in and confesses to murders. Murders that haven’t occurred… yet!!! After each confession, the victim-to-be dies even though Val Kilmer is clearly still under lock and key. The cops involved need to figure out what’s going on before they become his next confession. Why? The unnamed drifter has a past with each of the officers in the station. (He was beaten into a coma when the lead detective thought he was responsible for the detective’s daughter’s kidnapping). Unfortunately, it’s too late by the time the cops begin to realize the connection. Also, I’d like to briefly highlight the methods used for each death. I don’t want to spoil much more, as I feel the movie is worth a viewing, but I will say that each death fits with the abuse the cops inflicted on the traveler. 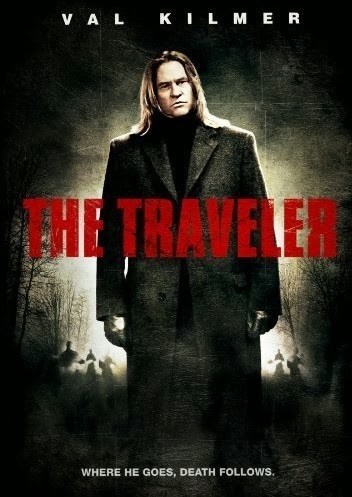 By no stretch of the imagination could this be considered a ‘return’ to form for Val Kilmer, but he played his vengeful role as well as can be expected.